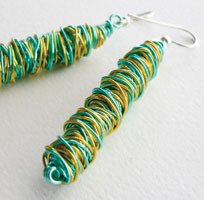 Freeform Wire Earrings Tutorial: Learn How to Make These Beautiful Freeform Wire Earrings! These gorgeous freeform wire earrings were created by Heather Saxon of Hotwired Beads, who generously supplied this tutorial. Thanks, Heather! NOTE: When winding the 'freeform bead', I have found that winding two spools together produces a more evenly finished bead (and in half the time! ), so if you are making a single colour bead try to use two spools. Holding the two 24 gauge wires in your left hand, with about 1" (2cm) tails, loop around a size 11 (3mm) knitting needle. Start by turning the needle away from you, capturing the tails under the wire coil. Continue twisting as evenly as possible, keeping wires slightly apart until you reach the desired length. Working in the same manner, wind the wire back down to your starting point and continue up and down the 'bead' length until it is as thick as you want it. Try to make sure the beads don't 'taper off' at each end. Finish the bead with several tight coils around the knitting needle, flush to the bead end. Flush cut carefully and give the bead a squeeze from each end with flat nose pliers. WOTWS (working off the wire spool/supply), slide a bead onto 20 gauge wire and with the end of your round nose pliers coil the wire three times to make a tiny uniform coil. Finish with the cut end flush against the wire coil bead. Holding the bead firmly down on this coil, cut wire leaving a 2" (5cm) tail and form a single eye loop. Insert it through the loop of earring wire and twist wire snugly around the neck of the formed eye pin. Much thanks to Heather Saxon of Hotwired Beads for giving us this awesome freeform wire earrings tutorial! Be sure to show your support by checking out her site here. Why not make your own earring wires? Find out how here! © 2019 how-to-make-jewelry.com - All rights reserved.